Led by one pastor, a group of priests, deacons and lay ecclesial ministers, called a pastoral team, would provide pastoral services to parishes in the collaborative. Under the plan, each parish in the collaborative group will maintain its separate identity and retain control of its own property and assets. Cardinal O’Malley said the new pastoral plan comes in response to current challenges faced by the Catholic Church in Boston, and could change if those realities improve. He approved the plan Nov. 15. Called “Disciples in Mission,” the plan identified parishes’ main challenges: declining Mass attendance, shrinking numbers of priests and trained laity, and an increasing number of parishes unable to sustain themselves financially. Published in September, the plan contains the final recommendations of the Archdiocesan Pastoral Planning Commission based on research and information gathered through 40 consultations held from December 2011 through March 2012 throughout the archdiocese with priests, church staff and volunteers. 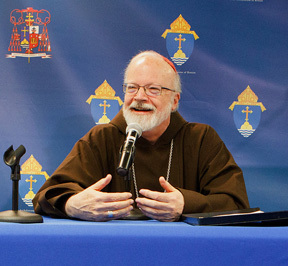 Cardinal Sean O’Malley, archbishop of Boston, at the Nov. 15 press conference. “Though the challenge of renewing the church will call for significant effort and a new way of staffing our parishes, we are committed to re-engaging the culture, the current generation of Catholics and providing a strong foundation for those who will follow us. Our Catholic faith is our most precious gift,” the cardinal said. His prepared remarks were made available to The Pilot, Boston’s archdiocesan newspaper, before he announced his acceptance of the plan at a press conference. “Parishes are the heart of the new evangelization; they must be well staffed and financially sound so as to be effective in this mission,” the cardinal said. Though the composition of teams would be different from collaborative to collaborative, reflecting the needs of each parish, team members would follow the pastor in serving all parishes in the collaborative. Each collaborative, the plan says, is a means for fostering common pastoral action and a common vision, not a structure “above” the parish, or coming between the parish and the diocesan bishop. The collaboratives will take shape in four phases over the course of five years. The archdiocese has not determined all collaborative groupings yet, according to Father Paul Soper, interim director of the Office of Pastoral Planning. Father Soper told The Pilot that parishes would soon receive a letter letting them know if their collaborative grouping has been determined. Parishes will be asked to respond to those letters, and those that want it will have a chance to be in the first phase of collaboratives. That first phase will be comprised of about a dozen collaboratives. Their experiences will be studied to hone the process as the phase-in continues. The proposal also calls for parish pastoral and finance councils to be consolidated to allow each to serve the collaborative as a whole, with subcommittees capable of acting on behalf of each parish. The pastoral plan also outlines training objectives to prepare pastoral teams and archdiocesan staff in theology, practices, management and leadership skills integral to the Catholic Church’s efforts for the new evangelization. The commission proposed that the Office of the Episcopal Vicar for the New Evangelization, the Catholic Leadership Institute and the Pastoral Planning Office form a partnership to promote training objectives in each collaborative. Training will take place in six stages geared to each level of participation in the archdiocese, from Pastoral Center staff to the pastors and the teams supporting them in the parishes. The Theological Institute for the New Evangelization will grant certificates to participants upon completion of training. Father Soper said a new website, www.DisciplesInMission.com, will provide blogs, information and daily updates to keep laity informed on developments as the process continues. 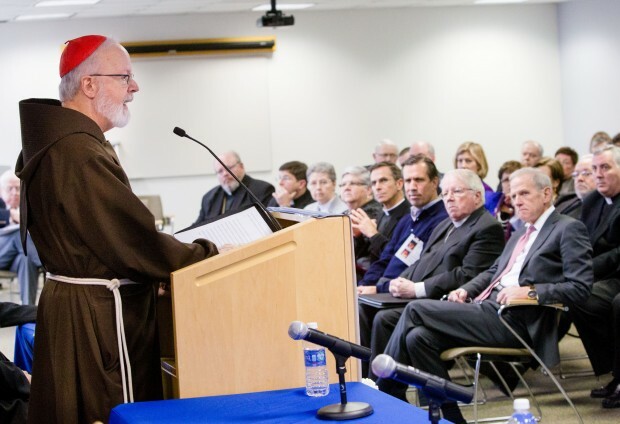 In January 2006, Cardinal O’Malley established committees to explore faith formation, marriage, and pastoral planning. The 15-member Pastoral Planning Committee — made up of priests, religious and lay leaders — was charged with suggesting ways for the archdiocese to use its resources to continue Christ’s mission. After 18 meetings over the course of 15 months, the committee in 2007 recommended a commission be formed to develop and implement a specific pastoral plan for Boston. The archdiocese created the Office of Pastoral Planning in 2008. In 2010 the archdiocese began a series of consultations with priests and laity that identified essential elements of a comprehensive pastoral plan. In 2011 the cardinal formed the 18-member Archdiocesan Pastoral Planning Commission — made up of priests, deacons, religious sisters and laypeople from around the archdiocese – to come up with final recommendations. Pineo is a reporter at The Pilot, newspaper of the Boston Archdiocese. It seems to me that the start of the demise of the Boston Catholic Church (and possibly the Catholic Church in the USA) was the actions (or lack of actions) by Cardinal Bernard Law. I also think that the much publicized meeting of the US Cardinals with Pope John Paul II (which turned into nothing) was a major contributing cause of the problems we now face in Boston and the USA. In the aftermath of these events, Catholics have generally stopped obeying the Bishops. I think the push back by the Bishops is an attempt to recover their authority which is “too little too late”.